Our goal is to create long-term value for our unitholders by delivering increasing distributable cash flow through organic expansion, development projects and acquisitions, while at the same time ensuring the ongoing stability of our business. We aim to provide the highest quality of customer service while maintaining focus on safety, compliance and the environment. Robert G. Phillips currently serves as Chairman, President and Chief Executive Officer of Crestwood Equity Partners LP, which he founded in October 2010. Mr. Phillips has more than 42 years’ experience in the energy industry. He previously served as the President and Chief Executive Officer of Enterprise Products Partners L.P. Prior to Enterprise, Mr. Phillips served as Chairman and Chief Executive Officer of GulfTerra Energy Partners, L.P., and as Chairman, President and Chief Executive Officer of Eastex Energy, Inc.
Mr. Phillips has previously served as a director of Pride International, Inc., Enterprise Products Partners L.P., Enterprise GP Holdings L.P. and Eastex Energy, Inc. He is currently serving on the board of directors of Bonavista Energy Corporation. Active in community organizations, he serves on the board of Sky High for Kids. Mr. Phillips is a frequent contributor to CNBC and FOX Business News. Mr. Phillips holds a B.B.A from the University of Texas at Austin and a Juris Doctorate from South Texas College of Law. Robert Halpin is Executive Vice President and Chief Financial Officer of Crestwood Equity Partners LP. In his role, Robert is responsible for overseeing Crestwood's capital structure and financial strategy, risk management, treasury, investor relations and sustainability functions. Robert joined Crestwood in 2012 and has served as both Vice President of Finance and Vice President of Business Development for Crestwood. Prior to joining Crestwood, Robert served as an Associate at First Reserve and an investment banker in the Global Natural Resources Group at Barclays Capital. Robert has a bachelor's degree in Finance from The University of Texas at Austin. Steven Dougherty is Senior Vice President & Chief Accounting Officer at Crestwood Equity Partners LP. He oversees accounting, reporting, tax and information technology. Steven joined Crestwood in 2012 and previously served as Interim Chief Financial Officer of Crestwood. Prior to Crestwood, Steven spent eleven years at El Paso Corporation as Director of Corporate Accounting and seven years working in public accounting at KPMG LLP. Steven holds a Master of Public Accountancy from the University of Texas at Austin. Joel Lambert is Senior Vice President, General Counsel and Chief Compliance Officer at Crestwood Equity Partners LP. Joel provides oversight and guidance on all legal matters, corporate governance and compliance. Prior to joining Crestwood in 2012, Joel was Vice President, Legal, at First Reserve. He joined First Reserve in 2007 and served on Crestwood's board of directors from 2010 to 2013. Prior to First Reserve, he worked as an associate attorney in the Business and International Section of Vinson & Elkins LLP, both in their Houston and Moscow offices. Before that, he was an Intern for Chief Justice Tom Phillips on the Texas Supreme Court as well as a Russian linguist and Military Intelligence Specialist for the United States Army. Joel served in Iraq and Saudi Arabia during Desert Shield and Desert Storm. Joel currently serves on the board of Junior Achievement of Southeast Texas. He holds a bachelor's degree in Environmental Design from Texas A&M University and a Doctor of Jurisprudence from the University of Texas School of Law. Will Moore is Senior Vice President, Strategy & Corporate Development at Crestwood Equity Partners LP. In this role, Will is focused on strategic planning and corporate development, including asset and M&A transaction origination, execution and commercial development to support the partnership's long-term strategic goals. Will serves as the head of Crestwood’s Kansas City corporate office. Will joined Inergy, which merged with Crestwood in 2013, as a legal analyst and business development associate. During his time at Inergy, Will held various positions in corporate and business development, including Director of Midstream Development and Vice President of Corporate Development. Will serves on the Board of Governors for the University of Kansas School of Law. He holds a B.A. and M.B.A from Fort Hays State University, and a Juris Doctor degree, from the University of Kansas School of Law. Alvin Bledsoe was appointed to the Board of Directors of Crestwood Gas Services GP LLC in July 2007. He was appointed to the Boards of Directors of Crestwood Equity GP LLC and Crestwood Midstream GP LLC on October 7, 2013. Prior to his retirement in 2005, Mr. Bledsoe served as a certified public accountant for 33 years at Pricewaterhouse Coopers LLP. Mr. Bledsoe currently serves as a director and as Chair of the audit committee of SunCoke Energy, Inc. (NYSE:SXC). He serves as Chair of the Audit Committee and a member of the Compensation Committee. Warren H. Gfeller was appointed to the Board of Directors of Crestwood Equity GP LLC (formerly Inergy GP, LLC) in July 2001 and the Board of Directors of Crestwood Midstream GP LLC (formerly NRGM GP, LLC) in December 2011. In addition, Mr. Gfeller currently serves on the Board of HC2 Holdings, Inc. (NYSE: HCHC) and previously served as President and Chief Executive Officer of Ferrellgas Partners, L.P. He serves as Chair of the Compensation Committee and a member of the Finance Committee. Janeen S. Judah was appointed to the Board of Directors of Crestwood Equity GP LLC in November 2018. She currently serves as a director at Patterson-UTI Energy, Inc. (NASDAQ:PTN). Ms. Judah previously held numerous leadership positions at Chevron including general manager for Chevron's Southern Africa business unit, president of Chevron Environmental Management Company and general manager, Reservoir and Production Engineering for Chevron Energy Technology Company (NYSE:CVX). She is Chair of the Sustainability Committee and a member of the Audit Committee. David Lumpkins was appointed to the Board of Directors of Crestwood Equity GP LLC in November 2015 after serving on the Board of Directors of Crestwood Midstream GP LLC since October 2013. He currently serves as a director at Westlake Chemical Partners GP LLC, the General Partners of Westlake Chemical Partners LP (NYSE: WLKP). He was the co-founder, and previously served as the Executive Chairman of PetroLogistics LLC, the general partner of PetroLogistics LP, until it was sold to Flint Hills Resources LLC in July 2014. He serves as Chair of the Finance Committee and a member of the Audit Committee. Gary D. Reaves was appointed to the Board of Directors of Crestwood Equity GP LLC in January 2019. Mr. Reaves is a Managing Director at First Reserve, a leading global private equity investment firm exclusively focused on energy, which he joined in 2006. Prior to joining First Reserve, he held roles in the Global Energy Group at UBS Investment Bank and Howard Frazier Barker Elliott, Inc. Mr. Reaves holds a B.B.A. from the University of Texas. John J. Sherman was appointed to the Board of Directors of Crestwood Equity GP LLC (formerly Inergy GP, LLC) in July 2001 and the Board of Directors of Crestwood Midstream GP LLC (formerly NRGM GP, LLC) in December 2011. Mr. Sherman is the former Chief Executive Officer and President of Inergy, L.P. and Inergy Midstream, L.P. and served in those positions until June 2013. He currently serves as a director at Great Plains Energy Incorporated (NYSE:GXP). John W. Somerhalder II was appointed to the Board of Directors of Crestwood Gas Services GP LLC in July 2007 and was appointed to the Board of Directors of Crestwood Equity GP LLC on October 7, 2013. He currently serves as a director at CenterPoint Energy, Inc. (NYSE: CNP) and a director at SunCoke Energy Partners GP LLC, the general partner of SunCoke Energy Partners L.P. (NYSE: SXCP). Mr. Somerhalder previously served as Chairman, President and Chief Executive Officer of AGL Resources Inc. (NYSE:GAS). He serves as Chair of the Conflicts Committee and a member of the Sustainability Committee. June 2013 Crestwood Holdings completes the acquisition of Inergy, L.P. general partner and contributes the general partner of Crestwood Midstream Partners LP to Inergy, L.P. This transaction is the first part of the merger between Crestwood and Inergy to create a fully integrated midstream partnership. Combined enterprise value in June 2013 was approximately $7 billon. July 2013 Crestwood completes acquisition of gathering, processing and crude-by-rail terminal assets in the PRB Niobrara for $150 million. 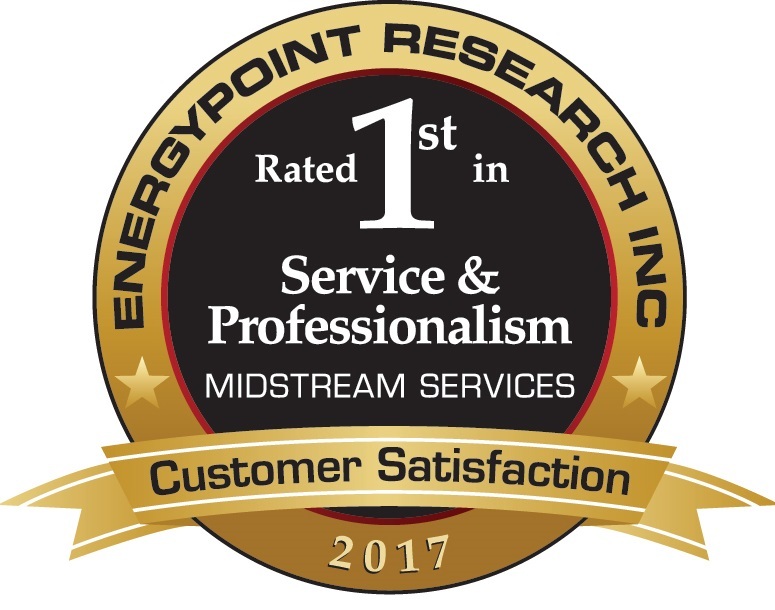 October 2013 Crestwood Midstream closes merger with Inergy Midstream, L.P. (NYSE: NRGM), the final step in the combination of Inergy and Crestwood, creating a mid-cap MLP platform with an enterprise value of $8 billion. 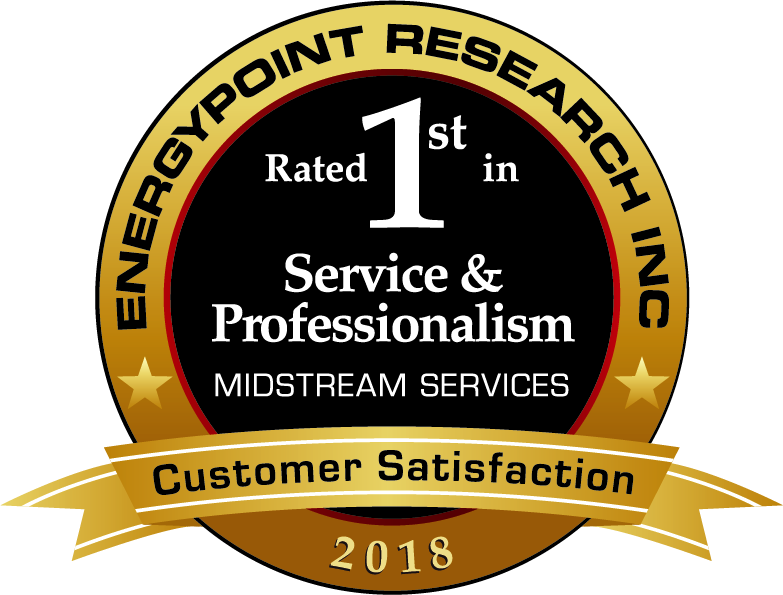 At the time of merger, Inergy Midstream, L.P. changed its name to Crestwood Midstream Partners LP (NYSE:CMLP) and Inergy, L.P. changed its name to Crestwood Equity Partners LP (NYSE:CEQP). 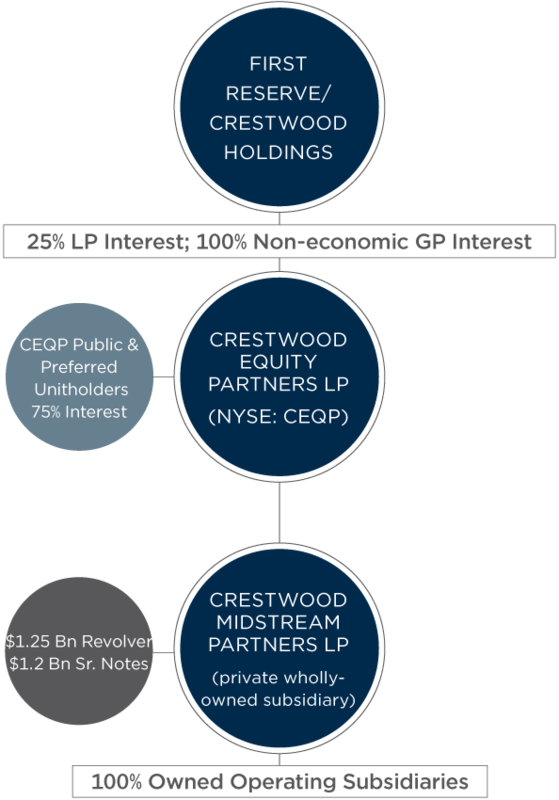 September 2015 Crestwood Equity closes merger with Crestwood Midstream creating one fully integrated partnership with common investors, customers and assets. Crestwood Equity's common units continue trading on the NYSE under the symbol CEQP. June 2016 Crestwood Equity forms joint venture with Consolidated Edison, Inc.
(NYSE: ED), named Stagecoach Gas Services LLC, to own and develop natural gas pipeline and storage assets in the Northeast. As part of the transaction, Crestwood Equity received approximately $975 million for 50% of its existing Northeast pipeline and storage assets contributed to the joint venture. November 2017 Crestwood Equity commissioned Phase 1 of the Bear Den Processing Plant to support increasing gas volumes on Crestwood’s Arrow gathering system. Phase 1 provides 30 MMcf/d of processing capacity which will be increased to 150 MMcf/d upon completion of the Phase 2 expansion in 2019. December 2017 Crestwood Equity divests US Salt, LLC, a non-core business in Crestwood’s traditional midstream portfolio, for approximately $225 Million. July 2018 Crestwood Equity commissioned the 200 MMcf/d Orla cryogenic processing plant, fully integrates Willow Lake and Nautilus gathering system, and secures long-term NGL takeaway solution. April 2019 Crestwood acquires Williams’ 50% interest in Powder River Basin joint venture for $485 million, doubling its position in one of its core, high-growth assets and becoming one of the largest gas processing companies in the basin. 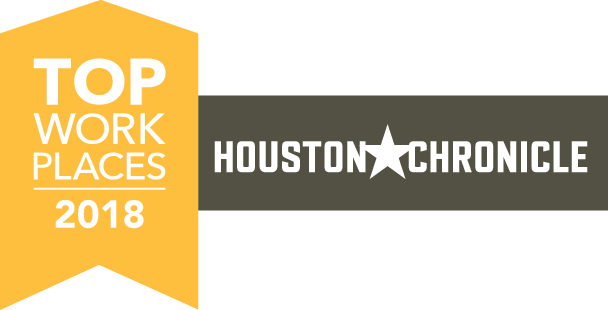 Crestwood is proud to be recognized among the top ranked companies in employee workplaces, customer satisfaction and environmental stewardship. 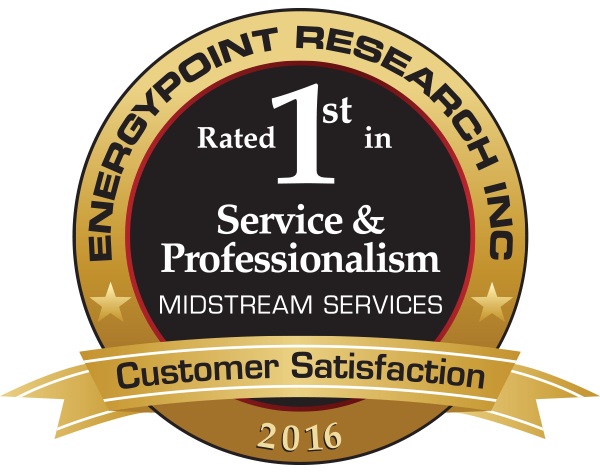 At Crestwood, we have a culture of excellence and always strive to be a best-in-class midstream provider.